Sister Pierre de Marie Rohart S.P.C. 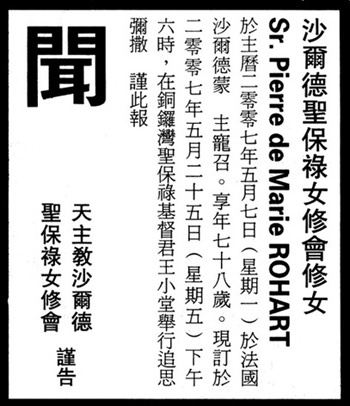 Sister Pierre de Marie Rohart, a former missionary to Hong Kong, passed away on 7 May 2007 in Chartres, France. Born in 1929 in Pas-de-Calais, she entered the Sisters of St. Paul de Chartres in 1953. Upon finishing a teacher training course in England, she was sent to Hong Kong in 1961 and immediately started teaching at St. Paul’s Secondary School in Happy Valley. During 16 years as a teacher and headmistress from1969, Sister Pierre left a vivid impression in the minds and hearts of all those whose lives she touched. Sister Pierre will be remembered as a kind and gentle person, whose face easily lighted up with a smile as soon as you met her. She administered the school, not only with firmness and determination peppered with compassion, but also with a real and strong sense of mission for the good of the students. She did not neglect the most important values in life. In fact, she considered it a priority that students were equipped with good human virtues - moral and spiritual. Her loving concern went beyond the confines of the school as she zealously pursued fund-raising activities, like the annual Caritas Bazaar, for the benefit of the disadvantaged in Hong Kong and abroad. She started the Christmas gift collection for the poor, instilling a sense of caring and sharing in students. She was loved, not only by the teachers and students, but also by the sisters, young and old, alike. She was appointed junior mistress in 1963 as she mirrored the ideal image of a good and faithful religious. The young sisters looked up to her as a model, who practiced what she preached. In recognition of her many gifts and talents, she was appointed superior in 1969, as well as a provincial assistant and secretary until she left Hong Kong in 1977 to take up more important work in the generalate in Rome. Her long service as secretary general, from 1979 to 2005, attests to her valuable contribution to the whole congregation. A Mass of the Resurrection was held for the repose of her soul on Friday, 25 May 2007, at Christ the King Chapel in Causeway Bay.